Another day, another low-volume traipse within established ranges. That sentence sums up yesterday’s action in equities and currencies rather succinctly, don’tcha think? To be sure, there’s still plenty of action in rates space-any day when red Eurodollars rally 25 bps can hardly be called “quiet” or “uninteresting”, that’s for sure. But from Macro Man’s perch, perhaps the most interesting market at the moment is commodities. The rise in crude over the last few weeks has been little short of inexorable. While the rally in prompt (front-contract) crude for much of May was mostly a curve trade, narrowing the steep contango in crude, over the last couple of weeks the belly/back end of the oil curve has exploded higher. Dec ’12 is up a full $10 over the last 10 trading days, for example. What’s driving this? To a degree it’s a dollar phenomenon, the same sort of “invoice currency” effect that we observed last year. Moreover, the rise in crude specifically and commodities generally has exhumed the momentum jockeys, who have started buying simply because the price is going up. But ultimately, it seems to Macro Man, the bedrock of the commodity bull story is down to the Chinese growth “miracle.” Call it the China syndrome. On the face of it, now looks like a great time to position long commodities for a China-driven bull run. After all, the PMI only ticked above 50 a few months ago. 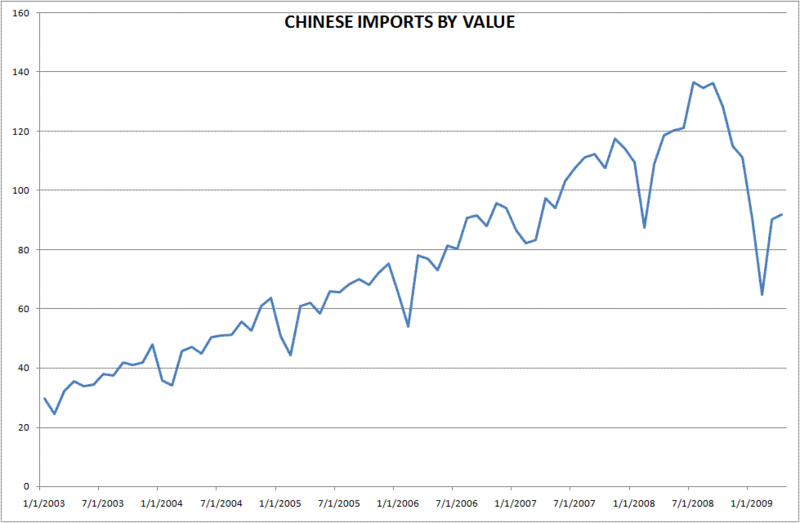 Perhaps more importantly, Chinese imports have not rebounded much at all in value terms. 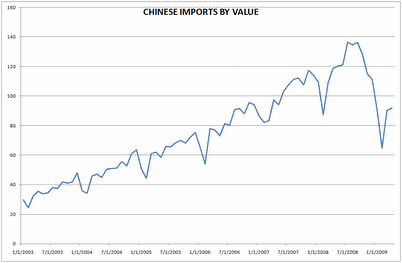 The chart below shows the nominal dollar value of Chinese imports since the beginning of 2003. Drilling down beneath the surface, however, we see a picture that is much less unequivocally bullish for commodities. While overall imports have barely started to recover in value terms, many commodity imports have absolutely skyrockjeted in volume terms. 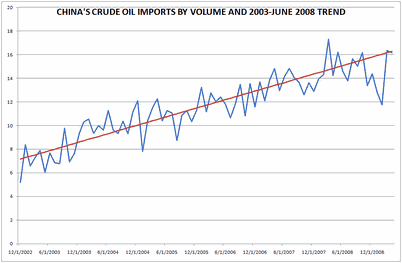 And at the end of the day, the inputs to China’s industrial and investment complex are based on volume, not value. 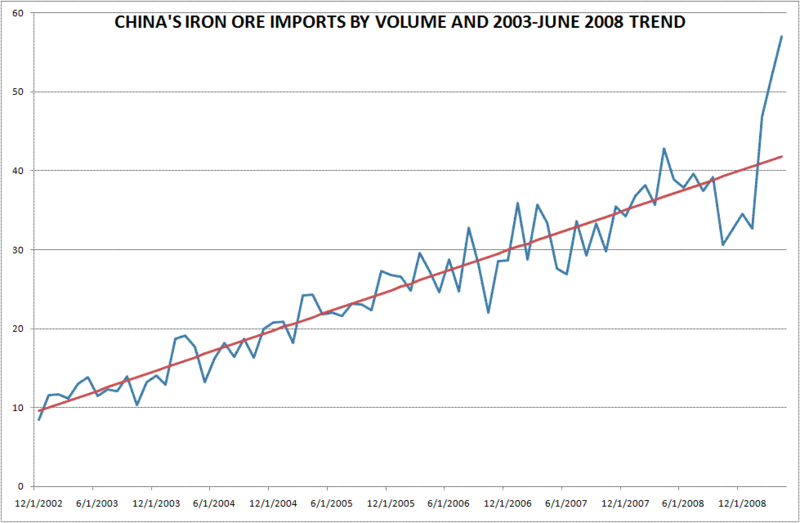 Macro Man ran a study looking at the import volume of four different industrial commodities, comparing it with the trend of 2003 through mid-2008, a period in which Chinese growth averaged 11%. 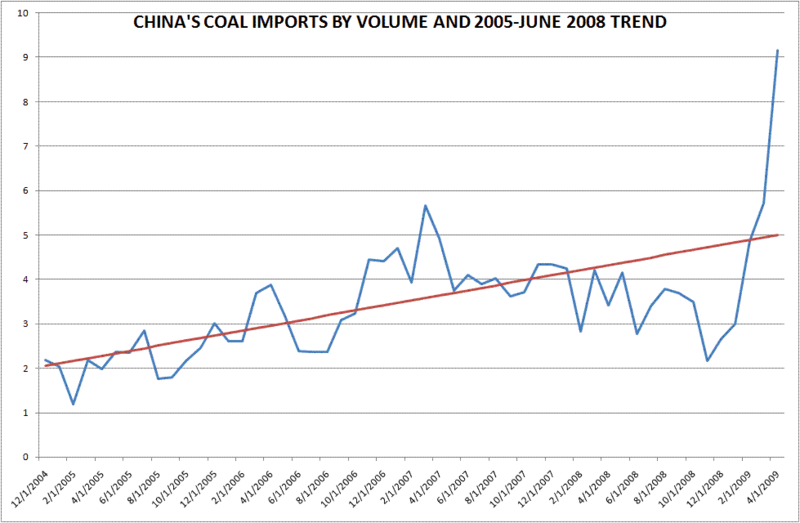 (Data for coal imports only begins in December 2004.) The results were remarkable. 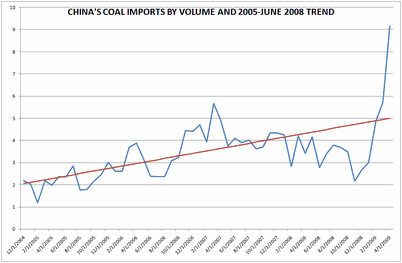 Starting with coal, for example, we see a modest upward trend in coal volume imports, which is surely what you’d expect from an indutrial country like China. To be sure, the noise around the trend was fairly substantial, even in the good times. But note how the last few months have seen import volumes blow through the trend and exceed prior highs by a very sunstantial amount. 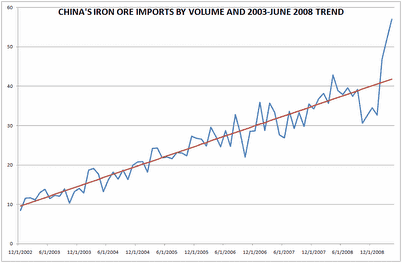 We observe a similar phenomenon in iron ore, where the prior trend was stronger (a steeper slope) and less noisy. 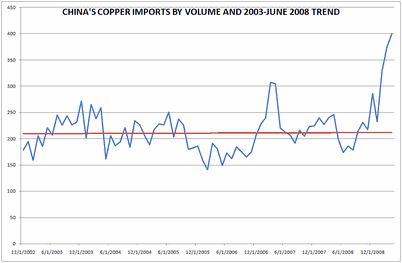 Again, import volumes have blown through where they “should” be had China continued along its 11% growth pace. Not coincidentally, there have been plenty of anecdotal reports recently suggesting that Chinese iron ore stockpiles are bursting at the gills and that there is a lengthy queue of ships waiting to deposit more on China’s shores. Copper is also quite interesting. 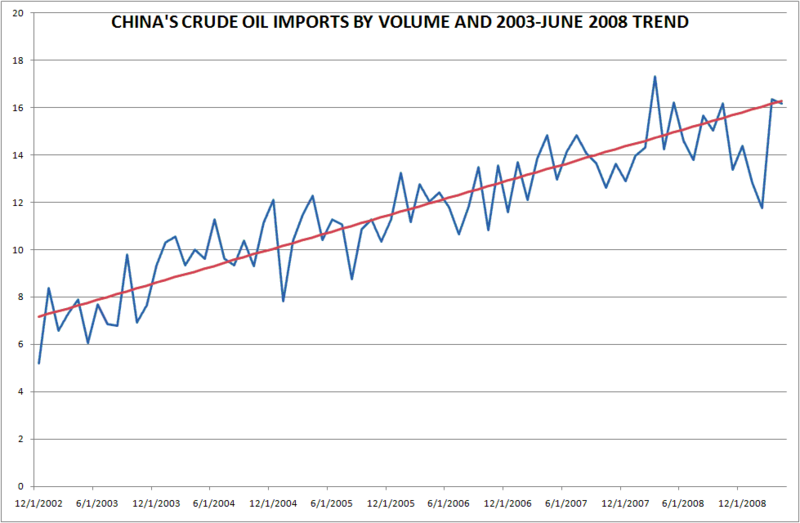 Unlike the prior two commodities, even during the good tiems there was no discernible trend in imports. You can see the peaks and valleys induced by prior policy actions from the central authorities. 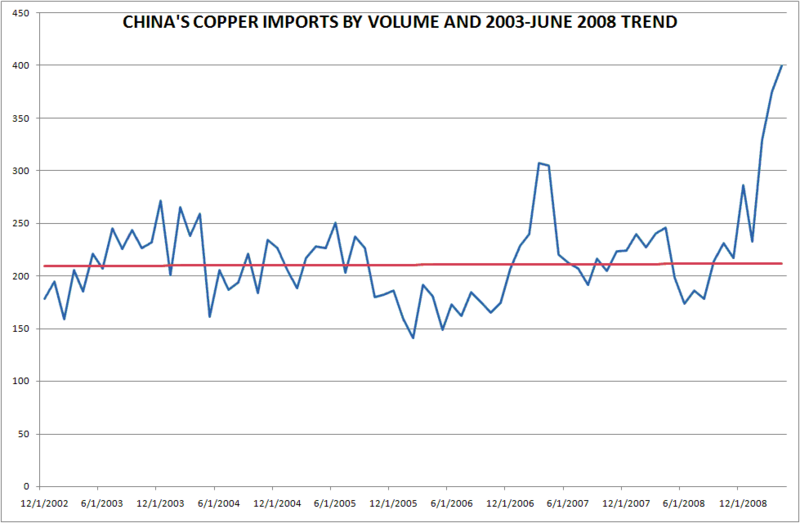 But again, the message is quite clear: China has recently imported much more copper than they ever did during the boom times. And finally, crude oil. This may be the most remarkable chart of all. While crude hogs most of the headlines in the commodity space, on the basis of this study at least China’s behaviour has had relatively little impact on price. Unlike the other commodities, import voloumes have yet to reach last year’s highs, and they have only now reached the trend of the salad days. May trade data is scheduled for release tonight, and it will be fascinating to see how imports evolved- both in value and volume terms. From Macro Man’s perspective, China has been been fairly shrewd in all of this, building large stockpiles of important industrial inputs at knock-down prices. For now, the China syndrome giveth….but if Macro Man were long high-beta plays on Chinese growth, he’d be concerned that at some point, the China syndrome may taketh away.